Gaeilge: Is trí mhéan na Gaeilge a déantar an chumarsáid agus an teagasc i Scoil Santain. Ní dhéantar faillí ar an mBéarla áfach agus ar an gcaoi sin bíonn na daltaí dhá theangach ar fhágáil na scoile dóibh. Irish is used as the medium of instruction in Scoil Santain. The children become billingual, thus adding an extra dimension to their education. 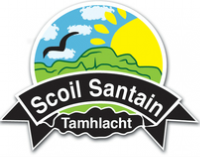 Amanna Scoile - Maidin: Tosnaíonn an scoil ag a 9 r.n. Oscloídh múinteoir geataí na scoile chun na páistí a scaoileadh isteach go clós na scoile ag 8.50 r.n., nó go dtí halla na scoile ma bhíonn an aimsir fhluich. Níl sé ceadaithe teacht laistigh de gheataí na scoile roimh a 9 r.n go dtí go mbíonn múinteoir ar dhualgas. School starts at 9.am. The school gates will be opened at 8.50am to allow children to enter the yard, or the school hall during bad weather. Under no circumstances should a child enter the school grounds prior to 9am until a staff member is on duty. Amanna Scoile - Tráthnóna: Is ag 1.40i.n a bhíonn deireadh lae scoile na naíonán shóisir agus sinsir. 2.40 i.n an t-am dul abhaile do dhaltaí ranganna a hAon go dtí a Sé. Don chéad coicís, téann na naíonáin shóisir abhaile ag a 12 méan lae. I rith an tréimhse seo, ba chóir na naíonáin a thabhairt díreach ag doras na ranganna. Tar éis an tréimhse seo is féidir leo dul ag an chlós lena daltaí eile. Bí poncúil agus tú ag bailiú do pháiste ón scoil. Ní cheadaítear do dhaltaí ranganna naíonán go Rang a hAon dul abhaile leo féin. Ní mór do thuistí/caomhneoirí/daoine fásta ainmnithe na daltaí a bhailiú in am ón seomra ranga. Junior and Senior Infants go home at 1.40pm, with First to Sixth classes going home at 2.40pm. During the first fortnight , the Junior Infant classes will go home at 12 noon. During this time, Junior Infants should be brought directly to the classroom door at 9am. After the initial two weeks, they should be brought to the school yard. Please be punctual when picking your child up from school. Children from Junior Infants to First class are not permitted to go home alone and it is important that their parent/Guardian or named adult are there to collect them from the classroom. Smacht: Cuirimid romhainn atmaisféar sona suairc a chothú laistigh den scoil. Tá sé mar chomh fhreagracht ar an foireann teagaisc, ar Bhord Báinistíochta na scoile agus ar na thuistí/chaomhneoirí, caighdéan dea-bhéasa agus dea iompair a chur chun cinn agus a chui i bhfeidhm. Tá ár gcód smachta bunaithe ar riachtanais ár scoile. Déantar aithbhreithniú rialta air. Tugtar cóip de Rialacha na Scoile do gach dalta agus ní mór do thuistí/chaomhneoirí é a shíniú gach bliain. We aim to create a happy and harmonious atmosphere within the school. The establishment and maintenance of acceptable standards of behavior is the joint responsibility shared between the teaching staff, the board of management and the parents. Our code of discipline has been devised to suit the needs of our school and is reviewed regularly. Each child receives a copy of the rules each year to be signed by Parents/Guardians. As láithreachtaí: Ní mór do thuistí/chaomhneoirí míniúchán scríofa a thabhairt don oide ranga uair ar bith a bhíonn an páiste as láthair. Ní ghlacfar le glaoch gutháin ina thaobh seo. Parents must give written explanation for all absences. Please do not telephone the school in this regard. Polasaí Lóin Folláin: Bímíd ag iarraidh ithe bhia folláin a chur chun cinn i measc na bpáistí i Scoil Santain. Ní ceadaítear seacláid nó milseáin don lón. Tugtar lón beag do dhaltaí ar scoil gach lá maidir leis an Scéim Bhainne/Lóin. We encourage healthy eating in Scoil Santain. Chocolate and sweets are not permitted for lunch. A small lunch wll be supplied to children daily as part of the Board of Education School Meals Scheme. Éide Scoile Éigeantach: Bríste/Sciorta/Pinafore dúghorm. Geansaí/Cardigan dúghorm. Léine/blús bán le carabht dearg.Traicéid le chaitheamh le t-léine airtex bán/dearg. Traicéide Scoile Éigeantach agus Geansaí Scoile: Le ceannach ó Scoil Santain. Gach eolas/foirmeacha ó oifig na scoile. Tugtar amach foirmeacha orduithe i Mí Bealtaine agus Mí Meitheamh. Scoil Santain has a compulsory uniform. Navy Trousers/Skirt/Pinafore. Navy Jumper/Cardigan. White Shirt/blouse with red tie. Tracksuit to be worn with white/red airtex t-shirt. Compulsory School Tracksuits and School Jumpers are to be purchased from the school. Order forms are given out in May/June. Information from the school office. Coinnithe: Is féidir coinne a shocrú le hoidí trí hiarratas a dhéanamh i bhfoirm scríbhinn má h-airíonn tú go bhfuil deacracht ar bith ag páiste ar scoil. Ba chóir dul i dteagmháil leis an oide ranga i dtús báire. Is fearr coinne a dhéanamh leis an bPríomh Oide ina dhiaidh sin. Is idir 9r.n agus 10r.n a bhíonn fáil ar an bPríomh Oide le haghaidh coinnithe le tuistí/caomhneoirí. If you feel your child is having any difficulties in school, bring this to the attention of the teacher, by sending a note requesting an appointment. In general all communications should be made first with the class teacher. At times the Principal will be available between 9am and 10am. It is advisable to make an appointment for consultation. Paircéail: Ar mhaithe le cúrsaí sábhailteachta, is ag carranna foirne amháin atá an cead iontrála thaobh istigh de gheataí na scoile. Is ag carranna fhoireann na scoile amháin atá an cead tiomáint ar bhoíthrín an chnoic os comhair na scoile.Bain úsáid as Eastáit Fhaiche an Bhaile/ Bóthar na hAbhainn Móire má tá gnó ar bith leis an scoil agat. Cloí le rialacha an Bhóthar i gconaí. In the interest of safety, staff cars only are allowed inside the school entrance during school hours. Staff cars only are permitted on the road linking Avonmore rd. with the main school entrance. No parking is permitted on the hill. Cars should be parked in Millbrook Lawns/Avonmore Estates. Private Gateways should not be blocked at any time. Please exercise extreme caution and courtesy at all times and observe the rules of the road.